Tandem Trailer, 8' x 5' with internal wall, customised shelving, absorbents and a transfer pump on a trolley. This trailer had some water based capabilities with mini air boom, absorbent water booms, skimmer and transfer pump. Absorbent Roll holders unclipped from the frame on one end and allowing them to swing out for easy access. 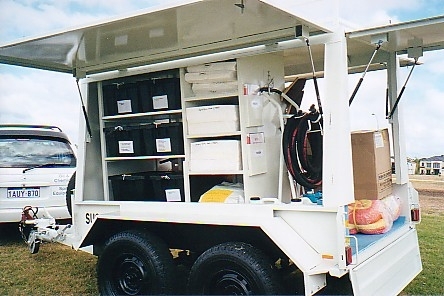 Custom roof mount boom storage box with gas strut doors.